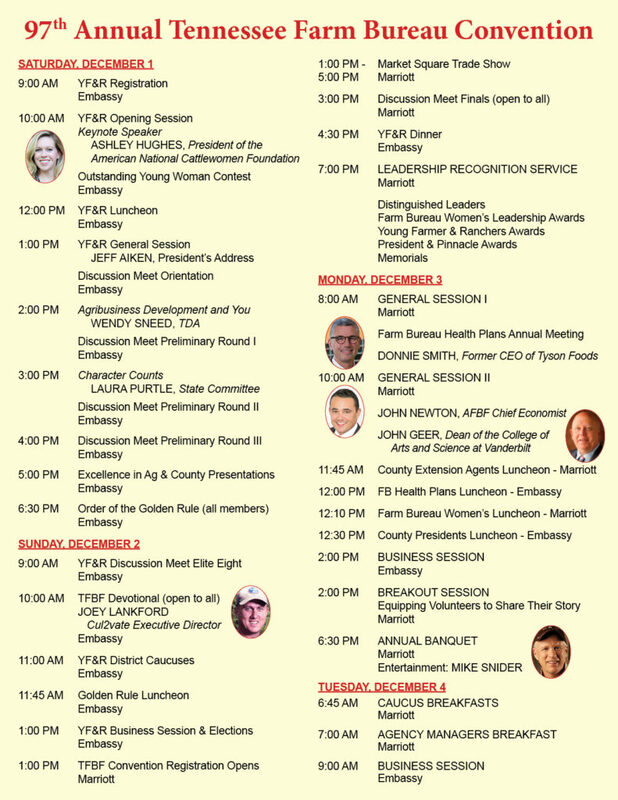 More than 1,500 farmers from across the state will gather in Cool Springs December 1-4 for the purpose of developing policy for 2019, electing leadership for the organization, presenting awards in membership categories, learning about the latest trends and issues in agriculture and fellowshipping with other farmers across the state. Former CEO of Tyson Foods Donnie Smith will provide a keynote address. Smith will speak on the War of the Words. Also highlighting the conference will be the American Farm Bureau Federation’s Chief Economist John Newton and Vanderbilt’s Dean of the College of Arts of Science John Geer. 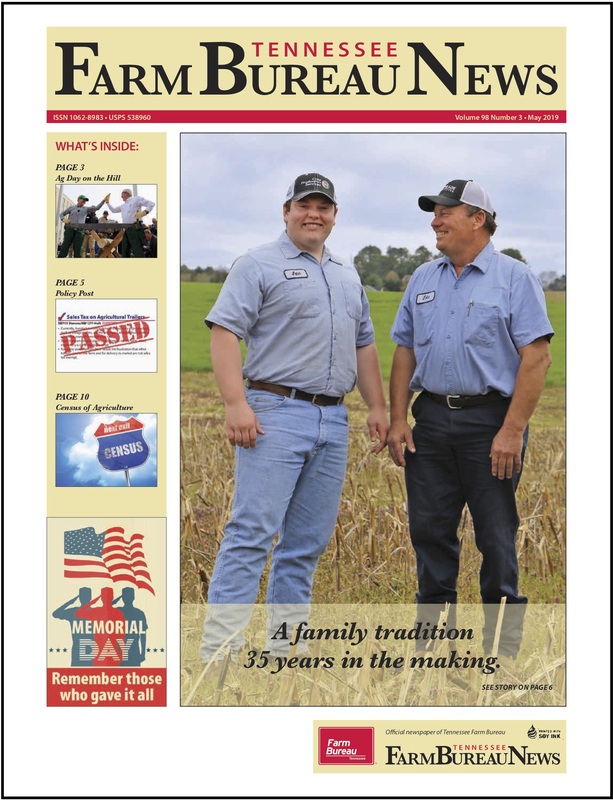 Dr. Newton will be covering the economic outlook for agriculture and Dr. Geer will be breaking down and interpreting the 2018 mid-term elections. The annual meeting also offers the chance to recognize individuals and counties for going above and beyond in membership categories like public relations, leadership, policy and service. Pinnacle awards are presented to those counties who reach the highest standards for membership, programs, and teamwork as evidenced by the cooperation between volunteer leaders, agents and staff. 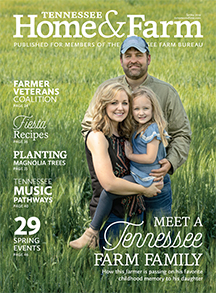 Five individuals will be presented with Tennessee Farm Bureau’s highest honor – the Distinguished Service Award – for their dedication to their community, leadership and Farm Bureau. From District One is Obion County’s Billy Sellers, District Two is Maury County’s Jean Crowe, District Three is Hamilton County’s Dorotha Lee, District Four is Jackson County’s Herman Pippin and District Five is Jefferson County’s Dale Franklin…Awards will also be presented in young farmer contests for Outstanding Young Woman and Discussion Meet. As a tribute to those leaders who passed away over the last year, a memorial service will be held Sunday evening and a special memento given to those families. 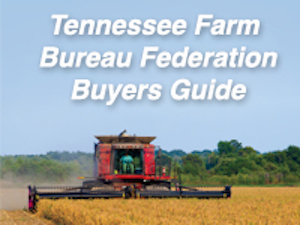 During the three-day meeting, one of the most vital parts is the day and a half when voting delegates will discuss and potentially adopt new policies to guide the Tennessee Farm Bureau for the next year and elect leaders to the board of directors.